Learn the rules, then break the rules. Artists have always rule breakers. The groundbreaking writers of history tried stuff others weren’t willing to. They scoffed when told that poetry had to rhyme or that protagonists had to be admirable or that short stories couldn’t be great literature. Writers are famous for making up words and toying with the principles of punctuation, capitalization and grammar. Just don’t make the mistake of thinking they didn’t know what they were doing. These masters didn’t violate rules out of ignorance. They learned the rules first. They followed them too, until the time came to stretch the limits. 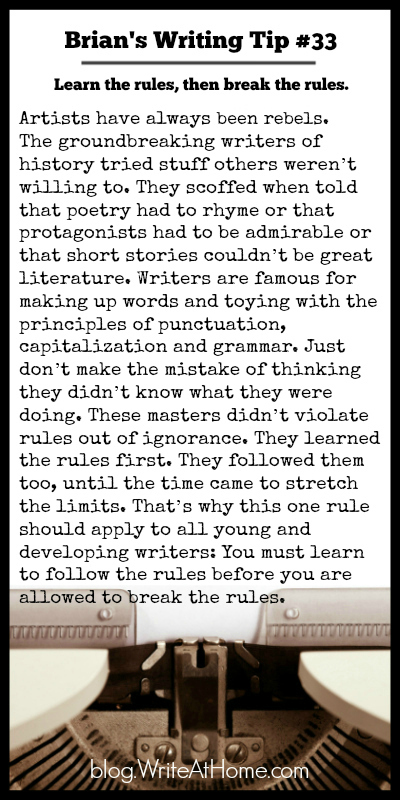 That’s why this one rule should apply to all young and developing writers: You must learn to follow the rules before you are allowed to break the rules. Bloggers love comments. Leave yours in the Reply section below.